In the Vietnamese miniature landscape art of Hon Non Bo, figures are often added to convey specific messages or themes. Egrets, for example, pay homage to a wife’s love and devotion*. In this sculpture, created as a centerpiece for the wedding of the artist’s son, two handmade egrets are making their home together on a ledge overlooking a lagoon. Pieces of a large feather rock were shaped and reassembled as an island cairn. 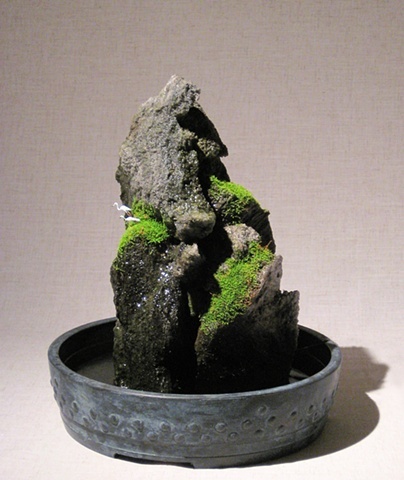 A hidden miniature pump creates a series of waterfalls bordered by mosses. The Korean tray, a casting of 85% mica and graphite, was sealed and finished with a bronze patina. *Lit, P.V. and Buller, L. (2001). Mountains in the Sea: The Vietnamese Miniature Landscape Art of Hon Non Bo. Portland: Timber Press. p. 71.